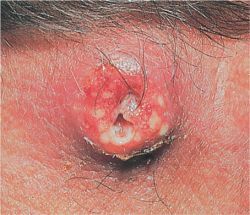 a painful nodule formed in the skin by circumscribed inflammation of the dermis and subcutaneous tissue, enclosing a central slough or “core.” Called also furuncle. Boils occur most frequently on the neck and buttocks, although they may develop wherever friction or irritation, or a scratch or break in the skin, allows the bacteria resident on the surface to penetrate the outer layer of the skin. A carbuncle is a group of interconnected boils arising in a cluster of hair follicles. Cause. Most boils and carbuncles are caused by Staphylococcus aureus. When these bacteria gain entrance to the skin, the infection settles in the hair follicles or the sebaceous glands. To combat the infection, large numbers of leukocytes travel to the site and attack the invading bacteria. Some bacteria and white cells are killed and they and their liquefied products form pus. The body's defenses may succeed in overcoming the invaders so that the boil subsides by itself, or the pus may build up pressure against the skin surface so that it ruptures, drains, and heals. Boils most often afflict healthy persons but occasionally their appearance is a sign that the resistance is low, usually as the result of poor nutrition or illness. Patients with recurrent boils should be suspected of being chronic staphylococcal carriers. The nose is the most common carriage site. Treatment. In most cases a single boil is not serious and will respond to incision and drainage. Systemic antibiotics are also sometimes indicated. Although complications are rare, a boil on or above the upper lip, on the nose or scalp, or in the outer ear can be serious because in these areas infection has easy access to the brain. Other danger zones are the armpit, the groin, and the breast of a woman who is nursing. If bacteria from a boil enter the bloodstream, septicemia may result (see blood poisoning). A localized pyogenic infection, most frequently by Staphylococcus aureus, originating deep in a hair follicle. Aleppo boil , Delhi boil cutaneous leishmaniasis (Old World). a skin abscess. A tender, swollen area that forms around a hair follicle. See also furuncle. 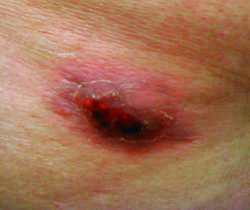 noun A painful, inflamed, circumscribed, often staphylococcal skin infection with pus and blood and a central fibrous mass of necrotic tissue (core); if there are multiple cores, it is a carbuncle. So-called blind boils suppurate imperfectly, or fail to come to a head. Tender to painful, pea-sized or greater, swollen hot red nodule, which may ooze pus or weep. Warm, wet compresses; oral or topical antibiotics; drainage as needed. verb To heat to a boiling point, or cause ebullition; as in, to boil water. Infectious disease noun A painful, inflamed, circumscribed, often staphylococcal skin infection with pus and blood and a central fibrous mass of dead tissue, aka core; if multiple, a carbuncle; so-called blind boils suppurate imperfectly, or fail to come to a head Clinical Tender pea-sized or greater, red nodule, which may ooze pus or weep Management Warm, wet compresses; oral or topical antibiotics Complicating factors CA, DM, immunosuppressants. See Dehli boil verb To heat to a boiling point, or cause ebullition; as, to boil water. Warm moist compresses relieve pain and encourage drainage of the infected nodule to the skin surface. Oral antistaphylococcal antibiotics, such as trimethoprim/sulfamethoxazole or clindamycin, are given when the lesion is surrounded by local cellulitis. Incision and drainage is sometimes needed. An infection of a hair follicle which has progressed to abscess formation. Most boils are caused by STAPHYLOCOCCAL infection. A stye is a small boil in a lash follicle. A localized pyogenic infection, originating deep in a hair follicle. n a painful skin lesion caused by infection of a hair follicle, characterized by a central core surrounded by inflamed tissue. a painful nodule formed in the skin by circumscribed inflammation of the corium and subcutaneous tissue, enclosing a central slough or 'core'. Called also furuncle. deep-seated subcutaneous abscesses under the saddle place. Associated usually with poor grooming technique. A. Have you ever consulted a dermatologist (a doctor that specialize in skin problems)? He or she may diagnose the problem more accurately and address it better. What you describe may be acne or other disease that are treated by such doctors. Q. hey how about having brown rice in place of white or boiled rice…….? A. Brown rice is a good carb, plus I personally think it tastes delicious. Q. what should i do if i got burned from boiling water? how should i take care of my self? will i get a scar? Light microscopic images of raw and boiled shrimp, focusing mianly on the transverse inner part of the shrimp meat, indicating muscle fibre, endomysium and perimysium, are shown in Fig. For a more impressive presentation, roast boiled potatoes whole with their skin on. When we decided to become a bit more professional about sugarmaking, we began by looking for a small stainless steel pan, or "evaporator," which holds the sap while it is boiled down to syrup. As compared with the change from base level in the filtered coffee group, the serum total cholesterol level increased after the consumption of boiled coffee by 0. Martin Holt, whose great uncle Fred was a leading sweet maker in the city, has brought back the family label and hopes to corner a niche market for traditional boiled sweets. INGREDIENTS: 250gBasmati Rice, 3tbspn oil,four cloves,4 -5 green cardamoms,quarter tspncumin seeds, salt, water,100gcarrots,boiled and diced; 100ggreen beans, boiled and dived; 125gcauliflower florets,boiled. You state that boiled potatoes have no detectable acrylamide. When the water has boiled, add fresh pasta, bring to a second boil and prepare to check pretty soon. The boiled water advice issued on the 29th November remains current. This keeps the egg yolk exactly in the middle of the boiled egg. Originally, bisque was used to describe any highly spiced dish of boiled meat or game (Montagne 99). Any water collected in a non-potable container (bathtubs, previously used buckets, and so forth) should be boiled before consuming.